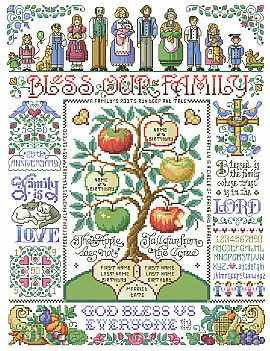 Our most ornate and detailed family tree theme samplers by designer Sandy Orton will be an heirloom for generations to come. This would be perfect for a wedding couple to start their lives together. Dozens of Classic Americana style motifs are perfectly melded together into a beautiful sampler. These little motifs can be used separately on small projects or all together in one fabulous sampler.